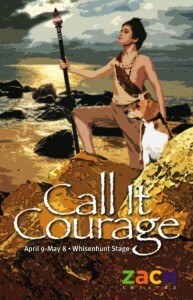 SEP 28, 2010 – CALL IT COURAGE nominated for Best Production, Best Script! 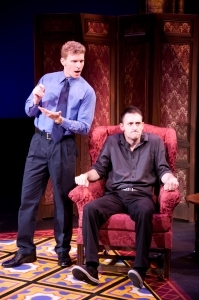 The Zachary Scott Theatre production of CALL IT COURAGE in Austin, TX, wins 5 B. Iden Payne Award nominations: Outstanding Production of Youth Theatre, Outstanding Original Script (Adam Overett), Outstanding Director of Youth Theatre (Adam Roberts), Outstanding Choreographer (Adam Roberts), and Outstanding Young Performer (Alina Vega as Mother at some performances). Congrats again to Adam Roberts, Zach Theatre, and the marvelous Showstoppers! Sep 27, 2010 – Dramatists Guild Fellowship begins! I’ve been selected to be a 2010-2011 Jonathan Larson Fellow at the Dramatists Guild! The Larson Fellowship is a yearlong workshop for musical theatre writers and playwrights, led by Lynn Ahrens & Stephen Flaherty (Tony-winning creators of RAGTIME, ONCE ON THIS ISLAND and many other shows), Janet Neipiris and Susan Miller. I’ve got several shows in the works, and I’m looking forward to working on them, meeting potential new collaborators, and learning from the best of the best in this room! Can’t wait to begin! I’ve been selected to be a 2010-2011 Jonathan Larson Fellow at the Dramatists Guild! The Larson Fellowship is a yearlong workshop for musical theatre writers and playwrights, led by Lynn Ahrens & Stephen Flaherty (Tony-winning creators of RAGTIME, ONCE ON THIS ISLAND and many other shows), NYU’s Janet Neipris, and Susan Miller (ANYONE BUT ME). I’ve got several shows in the works, and I’m looking forward to working on them, meeting potential new collaborators, and learning from the best of the best! Joe Kinosian and I reprise our performances in his and Kellen Blair’s hilarious two-person musical murder mystery at the Hangar Theatre in Ithaca, NY. Two nights only! Get tickets here! Detective Marcus (Adam Overett) interrogates friendly old psychiatrist Dr. Griff (Joe Kinosian).